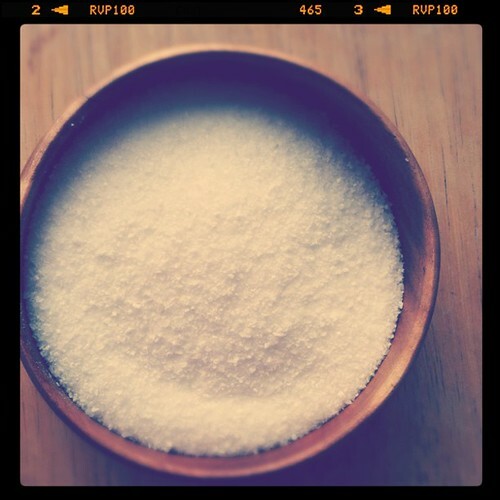 The other day, a reader left a comment on the blog asking about what is kosher salt. I directed him to an excellent piece in Wikipedia, hoping it hasn’t been altered by the likes of Sarah Palin, lest we learn that Paul Revere carried salt (as well as bells) with him on that famous ride. You never know. But in all seriousness, it got me thinking about various salt that we use for cooking. Some folks swear by their regular table salt. Others rely solely on sea salt. And still there are some folks who like fine salts, boasting dozens in their kitchen rotation. I happen to stand somewhere in the middle – I like fancy salts in some cases. I love the nuances different salts offer, and I have a few in my pantry (somewhere in there I have a wood-smoked salt from Japan – and it smells amazging!). But for standard cooking, particularly baking, I turn to kosher salt – it has a clean, unprocessed salt taste that works best, I think. Still, even with kosher salt, there are questions: Morton’s or Diamond Crystal? Personally, I stick with the latter, though I find that it’s a little more difficult to procure in stores. But across the board, I see more chefs using it, it’s finer than Morton’s, and you should adjust the proportions accordingly to compensate for the difference – i.e. because Diamond Crystal is smaller and flakier, you might need more of it, and if using Morton’s (which is larger) might need less. I hope this helps. And if anyone has any more questions, please post it in the comments and I’ll try to answer as well as I can. Sara – I think that there’s something like a 1.5:1 or 2:1 difference in weight between Diamond Crystal and Morton’s. I would definitely recommend to seek out DC, but that is my personal preference. :) Maybe Amazon will deliver it? I think Morton’s has anti-caking agents and stuff that DC doesn’t. As for iodized salt, I just can’t anymore. It has a stale, chemical taste to me. Bleh. Diamond Crystal all the way!